How nutrient-dense is your diet? That depends on how your food was grown in the first place. Conventional agriculture and food production follows a fast downward spiral into empty calories. Farmers in the U.S. and Canada grow a lot of corn and soybeans. These are the fillers for most processed foods. Such “monoculture” creates extreme mineral deficiencies in the soil. Traditional methods of crop rotation did not do this. Monoculture farming creates a vicious cycle of less and less healthy food. Every given crop has a certain mineral “fingerprint.” It draws on certain minerals from the soil out of proportion to the others. In effect, it strips the soil of what it needs most. This starves future generations of this crop of what they most need. The crop becomes weaker and less healthy over time. Weeds and pests start winning the war. What’s conventional farming’s answer? Spray more pesticides and herbicides. The problem is that the crop is still weak. And now we, the end consumer, ingest all these toxins. We get less nutrition with more toxicity. Alarm bells should start to ring when you see the large health price you’re paying for “cheap” food. We’ve failed to let nature’s pests do their job. That is, to alert us to weak, low-nutrition food. How does this play out in practical terms? It takes a lot more food now to get the same nutritional value. You’d need 200 loaves of bread to match the nutrition of a single loaf at the turn of the last century. Likewise, you’d need 45 bowls of today’s spinach to be on par with one single bowl from yesteryear. This same vicious cycle repeats itself in our inner ecology. Less nutrition means a weaker immune system. We use supplements and “fortified” foods to prop up our nutritional deficiencies. Like the weak crops, you may become susceptible to every bug going around the office. This is one of the reasons we find more and more people on regular rounds of antibiotics. Traditional, organic methods of growing and crop rotation do the opposite. They actually “rejuvenate” the soil. The crops are in robust health as they draw on mineral-rich soil. Start with organic, nutrient-dense foods. This is how to build up your health from the inside out. Build up your immune system to do what it does best. Drop synthetic supplements and ‘fortified’ food’. “Let food be thy medicine” is timeless advice. A foundation of solid nutrition cuts the need for antibiotics. Also note that you’ll find antibiotics in regular, non-organic milk. As always in health, deal with the root issue rather than the symptoms. Supplements and ‘fortified’ foods are not dealing with the root. Don’t let “more expensive” organic food be a deterrent – it takes you a much greater nutritional distance. 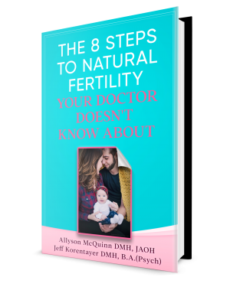 See the truth about “inexpensive” food, and keep it out of your fertility plan. « Are Your Hormones Marching To A Toxic Beat?